Animal Spotlight: Ozwald is Ready to Pounce! Looking for a Unique Addition to Your Next Event? Without fail, every week at least one person asks if I've seen the movie "We Bought A Zoo"; in truth, I have not. Due mostly to a mix of my inability to sit still for extended periods of time and disinterest in Matt Damon films (one exception - Good Will Hunting, of course.) From a quick Wikipedia search, I learned that it is about a family who buys a zoo in need of some love and works excitedly to prepare it for opening day. I understand how people would make the connection - we are a local icon, a zoo located on just under 4 acres of land, our team is a small family and, as I type this, they are working feverishly to prepare for opening day, which is scheduled for May 1st. As fun as the snow has been, we are beyond excited for the start of the 2017 season. A few of the great things in the works include: exciting new keeper talks and education programming, upgrades to our grounds and exhibits, partnerships with local businesses and fellow non-profits, and a brand new, state-of-the-art website debuting on opening day (special thanks to our friend Amy Scott and her talented team at Wild Apple Design Group). I heard some great feedback from the last e-newsletter. People were open and honest about their visits to The Zoo and offered suggestions for improving guest experiences and strengthening programs. It was fantastic - thank you for taking the time to reach out. It's important for us to have open communication with our community; that starts with you, our loyal followers and supporters. Several people asked about Membership - pricing, levels available, and perks of being a member at The Zoo. If you have questions about seasonal membership or group ticket discounts, I encourage you to reach out to Nicholas Kinsman at (413) 733-2251, ext. 304 or nick@forestparkzoo.com. Membership allows you entry to The Zoo throughout the 2017 season and a whole host of discounts. Speaking of discounts - if the weather stays this nice, we might even open early... with discounted rates! Check out our Facebook page (www.facebook.com/thezooinforestpark) for updates on any early open dates and for other exciting news and interesting posts. Thank you for supporting your local, independent, non-profit Zoo! Have a question or suggestion? I want to hear it! 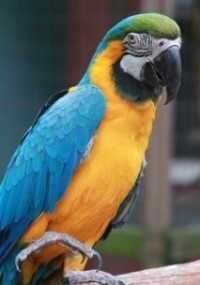 Local celebrity, Poncho, our blue and gold macaw, enjoys dancing to classic rock in his down time. Our red-tailed boa, Simba, just recently shed her skin and, at her last check-up, measured 9 feet, 8 inches in length. Our main gate saw over 44,000 entries in 2016 - wow! Get Your Combo Tickets for Thunderbirds vs. Providence Bruins & Support The Zoo! Thanks to our friends at Teddy Bear Pools & Spas and The Springfield Thunderbirds, we are excited to promote an amazing opportunity to support The Zoo and gain access to a springtime deal for family fun! All proceeds from the sale of these tickets go directly to The Zoo. 1 Ticket to see the Springfield Thunderbirds vs. Providence Bruins on April 1st. And, as a special Thank You, a $10.00 Gift Certificate for Teddy Bear Pools & Spas. on April 1st at 7:05pm - Boomer Bobblehead Night! Purchase your tickets soon, this game will sell out. This is a $30.00 to $32.00 Value for only $12.00 or $14.00! For more information please contact Nick Kinsman at nick@forestparkzoo.com or (413) 733-2551, ext. 304. Parking for this event will be free with a suggested small donation. Teddy Bear Pools & Spas' owner, Ted Hebert, has been an active and generous supporter and board member of The Zoo since 1988. Thank You, Teddy, for putting this together! Resident African leopard, Ozwald, enjoys the warm rays of sunlight today, as he patiently waits for spring to arrive. Listed as “vulnerable” on the IUCN Redlist, leopards are solitary, nocturnal big cats that enjoy resting during daylight, and seem to come alive as the sun sets. 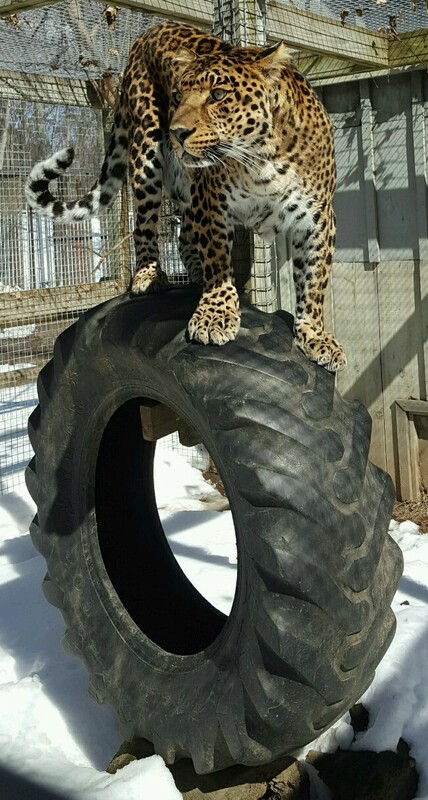 Quite strong, leopards are able to carry prey double their own weight into the safety of a tree, which Oz replicates through the pouncing upon, climbing in, tearing apart and marking of cardboard boxes stuffed with different toys, furs, and materials. Oz also thoroughly enjoys scent enrichment, in which water infused with herbs and extracts is used to mark areas throughout his enclosure for him to explore with his sensitive nose. You might find it interesting that cat nip has the same effect on Oz as it does his domesticated counterparts! In Need of a Unique Party Idea? Consider a Zoo On The Go program! From birthday parties and corporate events, to school presentations and booths - our Zoo On The Go program will bring The Zoo to you. Along with a knowledgeable and engaging staff member, you can explore diets, habitats, defenses, adaptations, daily zoo life, and more alongside our animal inhabitants both native and exotic. A recent reviewer said that the program was "informative and exciting!" and that The Zoo's representative was "a terrific presenter; very patient with the children and attendees." Starting at $125, we are happy to customize a program to your needs. Contact Ben Stafford at education@forestparkzoo.com or (413) 733-2251, ext. 305 to learn more about booking a Zoo On The Go program.